Employees, Partners, Customers and Prospects are overwhelmed by the amount of information that they deal with every day. The information age has become the age of information overload. Webinfinity enables a user to get straight to the information, systems and tools that they need. It is the only system that puts the user in complete control of what they want and how they want to see it. My Hub- Enabling you to create a personal workspace that will help every person in your ecosystem maximize their interaction with your content, internal systems and tools. Subscriptions - Providing your users with a continuous flow of information, alerts and suggestions based on their interests, role and contextual factors such as time and location. Explore - Automatically organizes and categorizes all your content enabling a user to easily find what they are looking for by vectors such as Topic, Product, Industry or Content Type. Collections - Find everything in one place at the touch of a button by organizing content using Collections. Content Management - Enabling you to connect the right people to the right information whilst also giving them the authority to manage it. Workflow Management - Set specific tasks/actions against relevant content to meet evolving business requirements. Lead Distribution - Vendors can distribute leads from their Salesforce environment to Partners, so they can be managed through the Webinfinity interface. Deal/Opportunity Management - Register a deal within the Webinfinity platform that will create a lead object in Salesforce. Define fields that each users see and deliver dynamic content based on the specific characteristics of the deal itself. 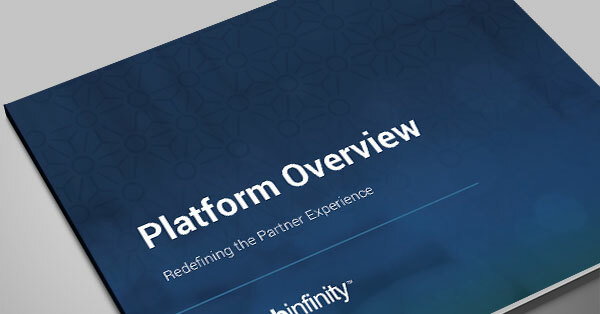 Connected Apps - Webinfinity’s SaaS platform provides an enterprise class framework that enables you to connect any existing or future apps to a single user experience - dynamically created around the individual needs of every user.